Our clients needed to be assured of a uniform level of service from our Destination Consultants around the world, but how to guarantee this? Going-there put our industry expertise to work and created the world’s first and only certification programme for Destination Consultants – the Certified Destination Consultant Professional ( CDCPsm) designation. This comprehensive programme, one of many online training programmes accessible to our Destination Consultants via GT Academy, ensures that every Going-there Destination Consultant understands excellence, is given the resources to achieve it and has that achievement recognised. Successful completion of this training requires the Consultant to demonstrate a firm grasp of a wide range of knowledge covering the entire relocation process, as well as an understanding and a commitment to Going-there’s high service quality standards. Training is focused on the specific areas of knowledge which are crucial to Destination Consultants in the employee relocation industry. Learning is split into a series of modules at introductory and intermediate levels, which have been developed to give trainees an industry overview as well as specific details pertinent to their role as a GT Destination Consultant. Destination Consultant Development – understanding the relocation industry in general and the specific standards set by Going-there. Customer Service Excellence – understanding what we mean by world-class customer service and how to consistently deliver it. Communication Essentials – incorporating GT’s verbal, written and unspoken communication guidelines. The CDCPsm modules have a global focus which, when combined with GT’s other region-specific and city-specific training, allows us to deliver a standardised programme of learning whilst also providing each individual with customised training for their location. Training is delivered online via the GT Academy learning portal. 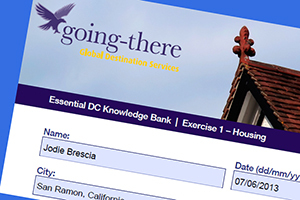 Destination Consultants are able to access their learning when they want and where they want. GT’s Centre of Excellence carefully monitors progress throughout the training to ensure that each learning area has been fully completed and understood before the next becomes available. If a candidate is finding progress difficult, additional coaching will be delivered by the Regional Operations Manager. Gaining CDCPsm designation is not the end of the journey for GT Destination Consultants. To maintain their designation, we require all our DC’s to continue their training by taking ongoing modules annually after they have received their CDCPsm designation. In addition to our definitive online training tools via GT Academy, and GT’s exclusive CDCPsm designation programme, our Destination Consultants receive intensive location-specific training. This training is designed to help GT Destination Consultants gain essential knowledge they will need while working with assignees moving to their cities of expertise. Every new Going-there Destination Consultant goes through a rigorous selection process to be certain that they have what it takes personally and professionally to deliver our world-class service. Once on board, they are required to research and respond to a bank of approximately 60 detailed tasks related to topics of high priority for assignees, such as housing, schooling and other general settling-in concerns. These tasks are designed to test the DC’s existing knowledge of their location, their initiative and their ability to research and gather information that is accurate and relevant to assignees and their families.